This is THE homily for the day. What is finally done speaks louder than words. Today a very human woman was declared a saint. For the many thousands she served throughout her ministry she was already a Saint-literally and metaphorically lifting them up out of the gutters and loving them into peace and dignity. If our Good Shepherd Ministry had Patron Saints, we would have St. Teresa of Calcutta and Dorothy Day, (although the Church may not catch up with the level of understanding to beatify Day in the forseeable future). We are thankful for the official recognition of Mother Teresa, though it was not something she wanted or needed. It is both Mother Teresa’s depth of service and understanding and her humanness- full of doubts and real questions about many things that makes her a role model for us. One can not look at people condemned to the bottom without a righteous anger at things that are and the ability to speak truth to power, and this she did. One cannot help to lift the poor without knowing and carrying the many frustrations and pain of that deeply inside. Those of us close enough to touch the poor with love must experience as she did a “darkness of the soul”. And yet our eyes are on the Light. We can ask her prayers for us in this experience. 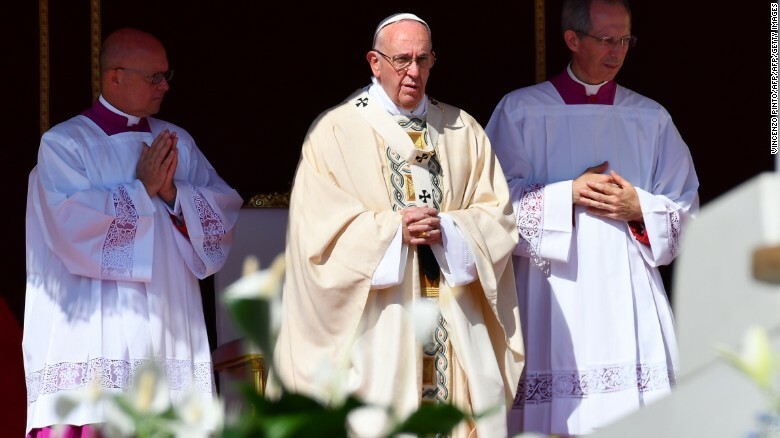 The Gospel for today: Luke 14:25-33 is excellent for today’s Papal homily at the beatification. For St. Teresa the costs of discipleship were carefully counted and her cross was borne every day. Possessions meant nothing to her except possessing the love and light of Christ in the darkness that seeks to envelop those who suffer in silence. Her actions were their voice. For St. Teresa’s gifts of life, and her realness and endless love of Christ and the poor we say now: St. Teresa of Calcutta, pray for us. These are her words: Love is not words. It is action. Our vocation is to love”. And of “residing in heaven” she said that she will not be there , she will be active in continuing to bring light to the darkness of the world, particularly the darkness that threatens to cover the poor and the sick. Thanks be to God for the life and light of St. Teresa! 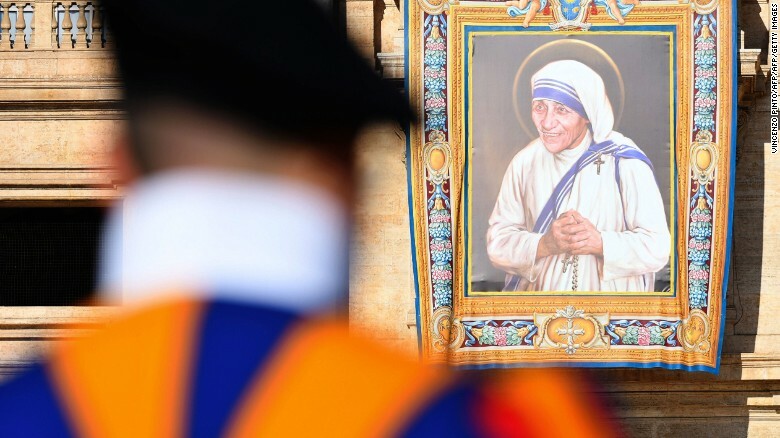 Vatican City (CNN) Mother Teresa, a Catholic nun who devoted her life to helping India’s poor, has been declared a saint in a canonization Mass held by Pope Francis in the Vatican. 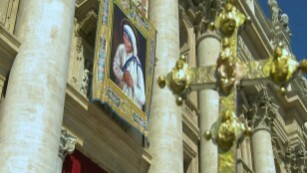 An image of Mother Teresa hangs from the facade of St. Peter’s in the Vatican. Pope Francis praised Mother Teresa as a model of compassion to Catholics worldwide.